Dimensions W 10' 8 11/16" x L 9' 3 1/16" x H 8' 6 1/4"
Select Pine Board, transparent vinyl. “Lakay” Haitian Creole for “at home," this is to represent the sanctity of the home, its relationship to community and the notion of wherever you go, there you are. Being an immigrant myself I can connect with the idea of relocating to a new land with dreams and expectations to be fulfilled almost in an utopian way. Reality then settles in and transformations to reach a middle ground are searched in order to adapt to his new reality. Changes and transformations are part of this neighborhood and part of the cycle of life. The art collective Poncili Creacion's work is composed of recycled materials. The collective believes in world conservation and in teaching all generations the importance of recycling if we want to leave this planet for future inhabitants to live safe. This particular piece means hope in the air, a rainbow of recycled foam erected on a humble house in the Little Haiti neighborhood. Beauty is in the eye of the beholder. La Belle Vue - Beautiful Sceneries. The beautiful scenery of this Caribbean gem and the Marabou woman supplants the thoughts of a suffering and hunger stricken Caribbean. The composition alludes to biological and botanical structures, while maintaining base sentiments of femininity, beauty, romanticism and decadence. The resulting work belies a personal narrative that expresses a reciprocal, romantic sentiment or pervasive sense of melancholy or longing. Ansanm, meaning together in Kreyol, is a cultural project by Michelle Lisa Polissaint that aims to bring the arts to Miami's diverse working class through community based events centered around the greatest equalizer; food. The act of eating dinner with a group of people is usually a joyous occasion allowing for long conversations. Ansanm creates a link between Miami's cultural insitutions and the working class communities that would benefit from increased access and representation. What do seven artists from different nationalities have in common in the environment of Little Haiti? That each brings with them their own diverse worlds. If these inherit worlds can be made to merge, it can become an amalgam of elements that can translate into a new world not tied in its completeness to any of the three representative continents. Creating between these lands a M E T A X Y is reached. Meaning the permanent place where man is in-between two poles of existence. Such as the there and the here, the infinite and the finite. 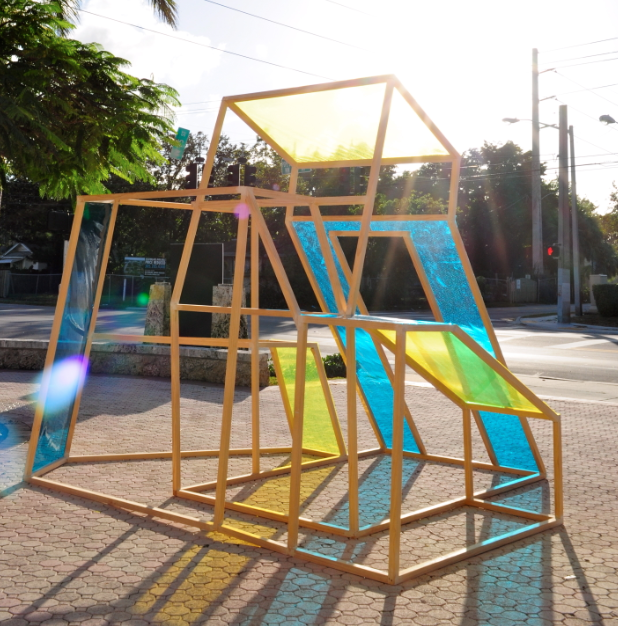 Each of the seven artists positions manifests a different view regarding becoming and being and only when they exist apart from their inheritance in a newly conjoined created liminal world can they connect with the possible unease of displacement and transformation that Little Haiti is undergoing. From intervening residential houses, churches and your corner sandwich shop with site-specific "ancestral monuments" to and event centered around the greatest equalizer : food , M E T A X Y promises to bring the Little Haiti community together while showing their history to the public.